Stanislaus County comprises the Modesto Metropolitan Statistical Area. The County is located just east of the San Francisco Bay Area and serves as a bedroom community for those who work in the eastern part of the Bay Area. The first European to see the area was Gabriel Moraga in 1806. The region was named Rio Estanislao in honor of Estanislao, a mission-educated renegade Native American chief who led a band of Native Americans in a series of battles against Mexican troops until finally being defeated by General Mariano Vallejo in 1826. Estanislao was his baptismal name, the Spanish version of Stanislaus ( Polish: Stanisław), itself the Latin version of the name of an 11th-century Polish Catholic Saint Stanislaus the Martyr. Stanislaus County has historically been divided socially and economically by the north-flowing San Joaquin River, which provided a natural barrier to trade and travel for much of the county's history. Isolated from the main rail corridors through the county and the irrigation projects that generated much of the region's economic prosperity, the part of Stanislaus County west of the river (known to locals as the "West Side" of the county) has largely remained rural and economically dependent on agricultural activities. Because of its proximity to Interstate 5 and the California Aqueduct some towns within this area, including Patterson and Newman, have experienced tremendous growth and are being transformed into bedroom communities for commuters from the nearby San Francisco Bay Area, while others (including Westley and Crows Landing) have been almost entirely overlooked by development and remain tiny farming communities. Stanislaus Regional Transit (StaRT) provides fixed route and dial-a-ride service throughout the county. StaRT also connects with Merced County Transit in Gustine and Turlock. Modesto Area Express (MAX) operates within Modesto, with limited service to Salida, Empire, and Ceres. MAX also runs special commuter routes connecting with the BART and Altamont Corridor Express rail systems. Modesto City-County Airport has previously had a number of scheduled passenger flights. Currently, its main air traffic is general aviation. Other (general aviation) airports around the county include Oakdale Airport, Patterson Airport, and Turlock Airpark. As of the census  of 2000, there were 446,997 people, 145,146 households, and 109,585 families residing in the county. The population density was 299 people per square mile (116/km²). There were 150,807 housing units at an average density of 101 per square mile (39/km²). The racial/ethnic makeup of the county was 69.3% White, 2.6% Black, 4.2% Asian, 1.3% Native American, 0.3% Pacific Islander, 16.8% from other races, and 5.4% from two or more races. 31.7% of the population were Hispanic or Latino of any race. 8.4% were of German, 6.3% English, 6.0% American, 5.5% Irish, and 5.1% Portuguese ancestry according to Census 2000. 67.8% spoke English, 23.7% Spanish, 1.5% Syriac, and 1.3% Portuguese as their first language. There were 145,146 households out of which 41.20% had children under the age of 18 living with them, 56.0% were married couples living together, 13.7% had a female householder with no husband present, and 24.5% were non-families. 19.4% of all households were made up of individuals and 7.9% had someone living alone who was 65 years of age or older. The average household size was 3.03 and the average family size was 3.47. The median income for a household in the county was $40,101, and the median income for a family was $44,703. Males had a median income of $36,969 versus $26,595 for females. The per capita income for the county was $16,913. About 12.3% of families and 16.0% of the population were below the poverty line, including 20.5% of those under age 18 and 8.8% of those age 65 or over. The Government of Stanislaus County is defined and authorized under the California Constitution and law as a general law county. The County government provides countywide services such as elections and voter registration, law enforcement, jails, vital records, property records, tax collection, public health, and social services. In addition the County serves as the local government for all unincorporated areas. Just like the neighbouring Merced County, Stanislaus is considered a bellwether county in presidential elections. It voted for the winning candidate for president in every election from 1972-2012. In 2012, Barack Obama won the county with 49.9 percent of the vote. The last Democrat to win a majority in the county was Jimmy Carter in 1976, although Barack Obama won a plurality in 2008 and 2012, as did Bill Clinton in both 1992 and 1996. In 2016, Hillary Clinton won the county but lost the election, the first time Stanislaus backed the losing candidate since 1968 when it voted for Hubert Humphrey. the 12th Senate District, represented by Democrat Anna Caballero. The California State University, Stanislaus is a campus of the California State University located in Turlock. 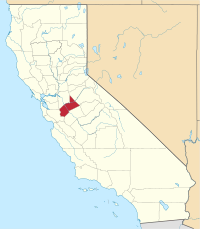 The Yosemite Community College District covers a 4,500 square mile area and serves a population over 550,000 encompassing all of two counties (Stanislaus and Tuolumne) and parts of 4 others ( Calaveras, Merced, San Joaquin and Santa Clara). It is composed of 2 colleges: Modesto Junior College in Modesto and Columbia College in Sonora in Tuolumne County to the northeast. The Modesto Press is the local online news site for Modesto and the surrounding areas of the Central Valley. The Modesto Bee is a Modesto-based daily newspaper. ^ "Stanislaus County". Geographic Names Information System. United States Geological Survey. Retrieved January 14, 2015. ^ "Mount Stakes". Peakbagger.com. Retrieved February 3, 2015. ^ a b c "American Fact Finder - Results". United States Census Bureau. Retrieved April 6, 2016. ^ KCRA News (August 3, 2011). "Proper Way To Say Stanislaus" – via YouTube. ^ "Contract Cities". Stanislaus County Sheriff's Department. Retrieved June 3, 2018. ^ "California's 10th Congressional District - Representatives & District Map". Civic Impulse, LLC. Retrieved March 1, 2013. ^ Stanislaus County, California (2016). "Top 10 Commodities" (PDF). Stanislaus County Agricultural Report. John T. Bramhall, The Story of Stanislaus. Modesto, CA: Modesto Herald, 1914.